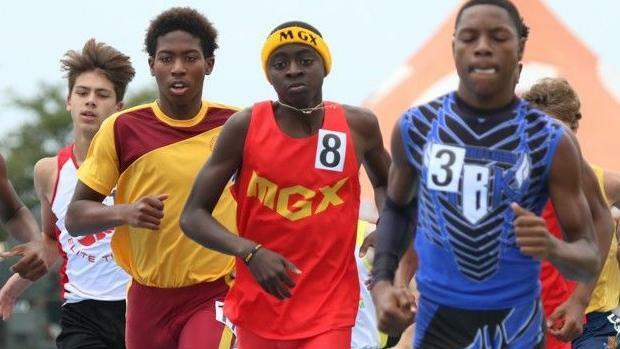 It might be too early to declare the new face of Miami Gardens Xpress, considering the club will watch the one athlete who put its club on the map nearly five years ago finish out his final summer season at the AAU Junior Olympics this coming week. But as Tyrese Cooper closes out a hall-of-fame youth career with one of the country's best programs, it's fair to ask who will eventually step into his shoes. And no one quite fits that description better than Mekhi Gammons. The 13-year-old runs all the same events as the 18-year-old Cooper and is fresh off a club record in the 400 meters at AAU Club Nationals, where he posted a time of 50.51 seconds. Ironically, though, it was only good enough for second-place, which likely means the rest of the youth track and field community is forming better training habits at younger ages. But that time is no joke. Gammons' 400m is now a shade ahead of Cooper's 13-year-old best of 52.25 and former MGX member Jamal Walton's former AAU national record time of 50.88 from his own 13-year-old year. Gammons' 200m best of 23.72 seconds also stacks up nicely against Cooper's 24.15 and Walton's 24.88 from that same 13-year-old age. Because four years ago, Cooper made his biggest jump from his 13-year-old to 14-year-old years, dropping under 50 seconds (48.69) and 22 seconds (21.81) for the first time. "He started from the bottom," MGX head coach Darius Lawshea said of Gammons, "and now he's breaking records." The fast-improving youth enters the AAU Junior Olympics this week with a chance to win individual gold in the 400m and 800m runs and will also team with MGX on two relays. But that's also a huge reversal from 2017, when Gammons really wasn't in the hunt in any individual event-- while he did leave home with two golds as part of MGX's 4x400 and 4x800 relay squads, he finished 10th in the 800m. "He's hungrier now," Lawshea says of Gammons' losing the 400m at AAU Club Nationals. "He wants to win this 400. He wants another chance." And yet what sets Gammons apart is his tenure in another event. While Cooper and Walton rarely ran the 800m at their young ages, Gammons has been focusing on it since he was 9. The teenager has improved at a rate of 7.3-percent over the last five years, with his most recent development chopping off 10 seconds from his 12-to-13 age years. Recently, he won his first major championship at AAU Club Nationals in a career best 2:05.12. Importantly, this year has represented his biggest leap yet. A year ago, Gammons wasn't even in the 800m finals. This year, he's the top seed. This year alone he's won six of seven finals, with his only loss coming at the Florida Middle School Championships when he ran 2:07.42. In time, Lawshea says Gammons might even go up in distance and start evolving into the 1500m. "His range is anything from the (200) to the 1500m," Lawshea said. "If we do the 1500m, he'll win it." Lawshea is careful not to pigeonhole his athletes anymore. For a time, he says, his kids were only seen as sprinters, a logical product of the state's predominance of national-caliber athletes. But over the last few years, MGX has made an effort to change that narrative. Lawshea encourages his athletes to try the lesser desired events like the 800m, 1500m and 3K. As a result, the club has five No. 1 seeds heading into distance events in 2018. Gammons is among that culture shift. What's made him so successful, though, is a character trait. Much like Cooper and Walton before him, Gammons has an unquestionable thirst for competition. "He wins every rep in practice," Lawshea said. "His gift is his work ethic." That formed seven years ago, when Gammons' father, Alphonza, first signed his son up for club track and field. Alphonza stuck on as a coach for the younger kids, while Lawshea took ownership of athletes 9-years and up. Over that time, Gammons began to show his competitive spirit. "His fight, he has one hell of a fight," Lawshea said. "It's just special to me. He didn't have that at 6 or 7 or 8 years old. He just showed glimpses of it." Training with MGX varies. The team practices on a short dirt oval adjacent to Miami Norland Middle School. But when they're not running, Lawshea is running the squad through an obstacle course he's developed. Nearly every day, he screams "You're training to be great!" "I want kids to say I'm an athlete," Lawshea said. "I want them to say, 'I can do everything.'" Gammons, who's an A student at Renaissance Middle School, has surely developed into a versatile runner. But as Cooper had Walton, Gammons also has a teammate capable of beating him on any given day. Fellow 13-year-old Dominick Grullon competes every day and owns PRs of 23.73 in the 200m and 52.06 in the 400m. "He's tired of being another ribbon kid," Lawshea said of Gammons. "He wants to be the guy. And I tell him, 'Your life is what you make it. Whatever you do in life is how you make it.'"